This article is about a world in Donkey Kong Country 2: Diddy's Kong Quest and Donkey Kong Land 2. For the ship itself, see Gangplank Galleon. 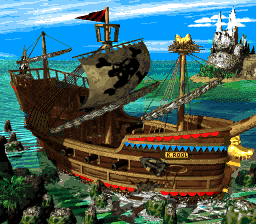 Gangplank Galleon is the name of the first world of both Donkey Kong Country 2: Diddy's Kong Quest and its pseudo-sequel, Donkey Kong Land 2. It takes place on the ship of the same name, which belongs to the Kremlings and their leader, K. Rool. As shown in the levels of this world, the galleon sports many chasms inside, which are dangerous for the Kongs. The masts form a good clamber system, and inside the ship is a flooded caliginous cargo. The masts, hold and deck host uncountable enemies, such as Neeks, Klomps and Kaboings, Flotsams, Puftups, Krunchas, Lockjaws, Shuris, Klobbers, and Click-Clacks. "What is the first enemy that you see in the game?" "What is the name of this area of the island?" "What button do you press to run?" "What is the name of the first level in the game?" "What is the name of the enemy boss who has kidnapped Donkey Kong?" "In the first level of the game, how many windows did the Kaptain's Kabin have?" "What is the name of the first rigging level?" "In the first level of the game, which of these is NOT a background object in the Kaptain's Kabin?" Kaizokusen "Baddo Kurūru" Pirate Ship "Bad K.Rool"
The manual for the SNES version labels the first world as Gangplank Galley despite mentioning Gangplank Galleon in its description. This was not corrected in the GBA version, which uses a slightly rewritten description that does not refer to it by the proper name. Due to the German translation of the level Lockjaw's Locker, the Gangplank Galleon has been believed to be a reference to The Flying Dutchman, a ship whose captain was cursed to roam the seas forever on that ship. The ship in fact comes extremely close to matching the ghost ship. ↑ Donkey Kong Country 2: Diddy's Kong Quest instruction booklet, page 20. ↑ Donkey Kong Country 2 instruction booklet, page 26. This page was last edited on February 19, 2019, at 16:38.